Dashing through the snow to Downtown Lakewood this holiday season? You may notice some new public amenities. This bench, sponsored by lion and blue, provides a resting spot along Detroit Avenue. 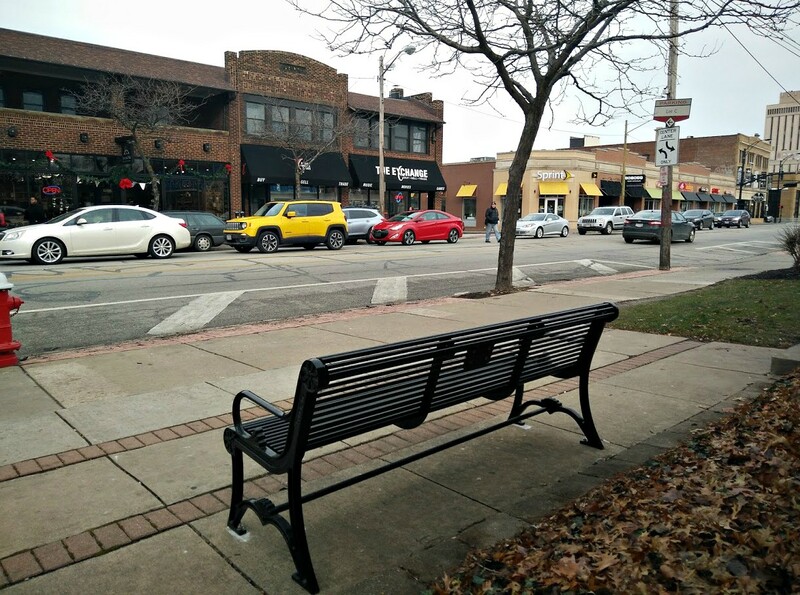 A collaborative effort led by LakewoodAlive’s Design Committee resulted in the placement of 17 benches and 12 waste receptacles within Lakewood’s downtown district, which extends along the Detroit Avenue commercial corridor from Bunts Road to Arthur Avenue. The collaboration involved the City of Lakewood, Lakewood residents, local businesses and civic organizations, as well as LakewoodAlive’s merchant association, the Downtown Lakewood Business Alliance. The initiative originated nearly five years ago when an elderly resident of the Westerly Apartments in Downtown Lakewood expressed a need for a place to stop and rest during her regular walks from her home to Cleveland Clinic Lakewood for treatment. A partnership between the City of Lakewood and LakewoodAlive soon followed to seek a solution. After LakewoodAlive’s Design Committee conducted a survey to identify appropriate locations for the placement of new benches, the City of Lakewood launched a pilot program, installing six benches and monitoring their usage. The pilot results warranted the installation of 11 additional benches strategically placed throughout the downtown district. 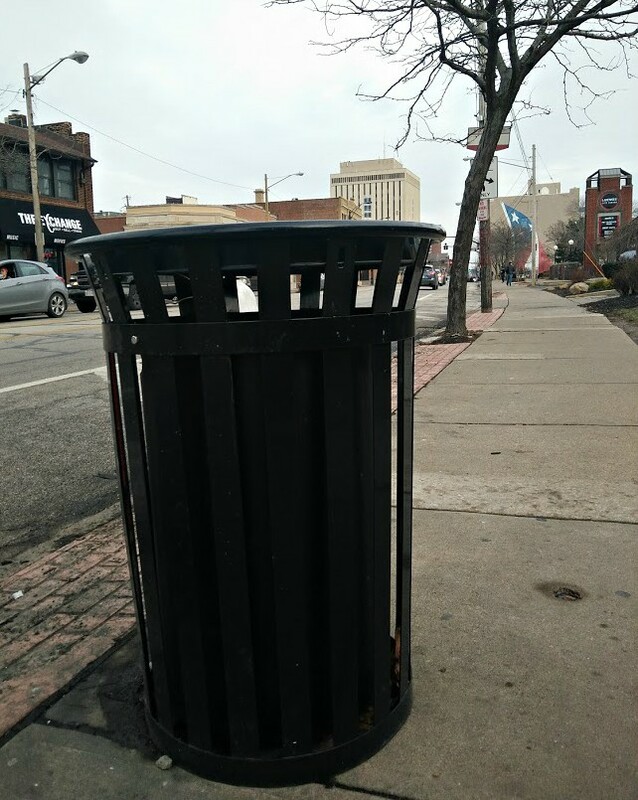 Concurrently with this project, LakewoodAlive joined forces with the City of Lakewood’s Division of Refuse and Recycling to address a shortage of waste receptacles within Downtown Lakewood. This partnership resulted in the addition of 12 waste receptacles to fill in coverage gaps, with the possibility to add even more in 2018. Whereas the City of Lakewood paid for the waste receptacles, the benches were primarily funded by sponsors, with the Downtown Lakewood Business Alliance covering the remainder of the cost. The family of the Westerly Apartments resident who voiced a need for more benches ultimately sponsored two benches. Although this resident is now deceased, LakewoodAlive hopes to host a dedication in her honor when her out-of-town family visits Lakewood during 2018. LakewoodAlive thanks the following businesses, individuals and organizations for their sponsorship of the recently-installed benches: Curt Brosky/Westerly Apartments (2), Downtown Lakewood Business Alliance, the family of Blythe Gehring, Kiwanis Club of Lakewood (2), lion and blue, Rotary Lakewood-Rocky River Sunrise Club and Tamara Racin & Tom Mohney (2). 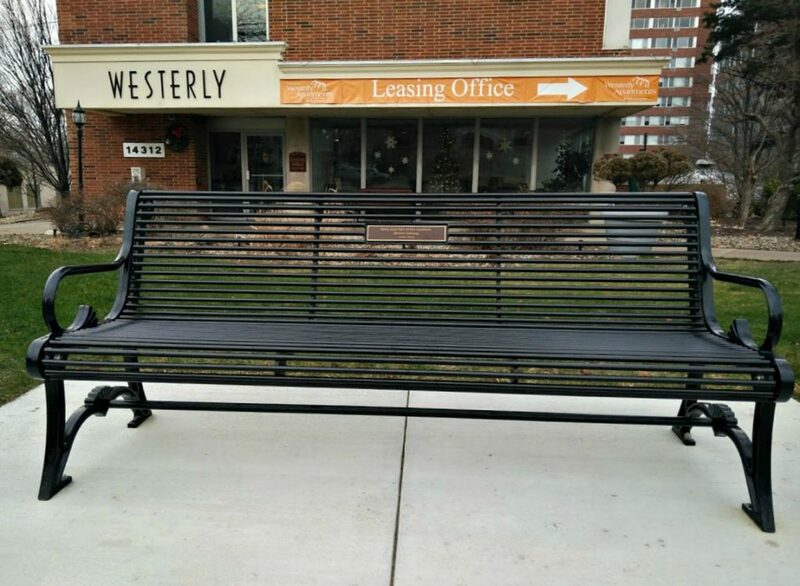 This bench honors the memory of the late resident of the Westerly Apartments who raised awareness regarding the need for additional benches in Downtown Lakewood.